A role model should be good, moral, and just. Followers of a god should expect their god to be the same. Fair, just, and good. What did your god do during the Holocaust? The Jewish god watched. Nothing was done to save the millions of Jews gassed by Hitler’s minions. Advertised as omnipresent, omniscient, omni-benevolent, and of course all powerful, where was this god while grandmothers, grandfathers,mothers, fathers, children, were shoved en masse into gas chambers and then piled like cordwood into mass graves? Was this god watching? Didn’t he see? 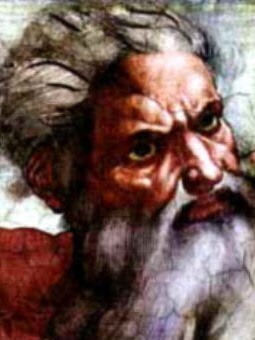 Why did this god not act? Suppose that you called the police having heard someone trying to test the strength of your door. You hide in the closet, hoping the police arrive in time before whoever, a thug perhaps, finds you. The police break in just as the creep finds you but enter silently, sneak up to your bedroom and watch as the monster drags you out of your closet and proceeds to apply deep life ending creases in your skull with the base of a brass lamp. Witnessing this atrocity, having the power to stop it all, yet taking no action, the police back out silently, reenter their cruisers and depart. What shall become of these supposed guardians? They were only acting as good as your god. They were only allowing your free will to play out. Perhaps god’s plan was for you to die horribly… if the police interfered they would thwart god’s plan for you. What if god’s plan for you was to have you become a booze guzzling derelict lying in a ditch? The good samaritan would have to act against god’s divine plan in order to rescue you. Wouldn’t that send the good samaritan straight to hell? Imagine better. The human mind can conceive of a god light-years better than that depicted in that horrid tome, the Bible. If you followed the teachings of the Bible today you would most certainly be rubbing elbows with the toughest crowd in the penitentiary. We should be better. Isn’t that what a parent wants? For the children to be better, more well off than they? Humans have a great sense of right and wrong, at least most humans, and can determine the right course of action by heeding their conscience. For example, suppose the check out clerk at the local store charged you twice for the same item… you’d make sure they knew about it… but what if you got your stash home and found that they did not charge you for an item? Would you rush back to the store to correct the error? Would you say to yourself that it makes up for a past overcharge, or serves them right as they charge too much? In the first example the clerk made an innocent mistake. In keeping an item unpaid for you have committed and immoral act. It can’t be equaled by past mistakes the clerk made which they were totally unaware of. You can choose to be better. You can do the right thing. Every day the omnipresent, omniscient, all powerful, and all benevolent god allows things to occur that must surely give believers pause. Yet, the power of the ideology is so great that believers go to extraordinary lengths to create excuses for god’s absence. Instead of realizing it is their province to stop these acts they continue blithely hoping that god, the god that let millions of Jews be massacred, will take action on their behalf. But then, that is the nature and purpose of the religious rhetoric. The lesson of the weak. To be immobilized, paralyzed, hoping that all mighty god will not ignore their pleas… yet again, again, and again. This allows terrible actions to be taken in god’s name. War, suffering, violence, and death is the foodstuff of religion. The more suffering, the better the ideology fairs. After all, what need of god if we alleviated all that ourselves? Be better than your god, if he/she existed, that is what he/she would have wanted. Think of churches as monuments, monuments on a grave, where your god died a long time ago but had high hopes you would be better than he/she was. This entry was posted in Religion and Reason and tagged As good as your god. Bookmark the permalink. This is really good stuff…..